Coptis chinensis, also known as Chinese goldthread, coptidis, and yellowroot, is a low-growing, creeping, perennial plant that is endemic to the cooler regions of Asia, most notably China. There, it’s extensively cultivated for its thin, yellow rhizomes or roots. The rhizomes of this plant are notable for containing a plethora of medicinal compounds that have made Coptis chinensis rather popular in traditional Chinese medicine. In fact, Coptis chinensis is ranked as one of the 50 most fundamental herbs in that particular system of medicine. Berberine is the most notable compound in Coptis chinensis. This yellow-hued, plant-based alkaloid has been utilized in both traditional Chinese and Ayurvedic medicines thanks to its ability to impact the body on a molecular level. Berberine has been linked to a wide array of health benefits that range from supporting gut health and reducing inflammation to lowering blood pressure. Thanks to its diversity and number of beneficial compounds, Coptis chinensis has a multitude of helpful medicinal properties that include acting as an antibacterial, detoxicant, anti-inflammatory, and antifungal. Coptis chinensis has many qualities that make it ideal for treating gastroinestinal disorders. As an anti-diarrheal and stomachic agent with analgesic and anti-inflammatory qualities, Coptis chinensis facilitates the digestive process and ensures that it continues smoothly. In turn, this means that Coptis chinensis can greatly reduce the risk of developing irritable bowel syndrome (IBS), dysentery, diarrhea, and painful bowel movements. By lowering blood sugar and cholesterol levels, Coptis chinensis can act as a preventive measure against such heart conditions as atherosclerosis. 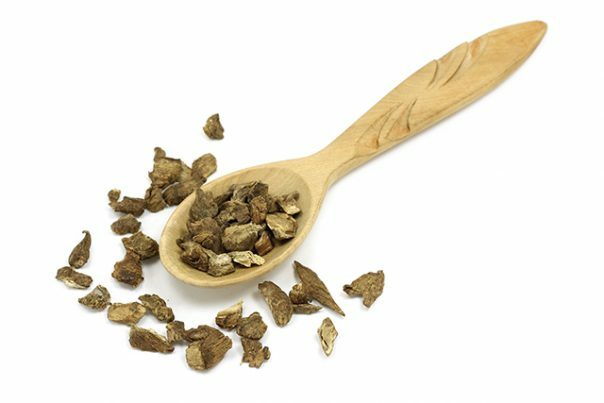 The potency of the antibacterial and anti-inflammatory qualities of Coptis chinensis applies to its topical use as well: Coptis chinensis poultices and compresses have been shown to be effective in remedying skin conditions like acne, boils, abscesses, and even burns. Moreover, the tannins have been shown to encourage quicker wound healing and curb blood flow, making it just as efficient in treating hemorrhages. Mouthwashes derived from Coptis chinensis are equally useful and are said to be of great use to those suffering from canker sores, toothaches, swollen gums, and sore throat. The positive impact on the digestive system has caused Coptis chinensis to become a recommended digestive aid among herbalists. Thanks to the great variety of compounds, Coptis chinensis can boost the immune system, heart, and liver. Due to the popularity of Coptis chinensis, it is most readily available as a powder, tincture, ointment, and capsule that can be purchased from stores specializing in traditional Chinese medicine or herbal remedies. Note that Coptis chinensis has been known to act as a uterine stimulant and is therefore not recommended for pregnant women. Coptis chinensis is a beneficial herb that been observed as a remedy for such health ailments as irritable bowel syndrome, atherosclerosis, acne, canker sores, diarrhea, and boils. Frequent use of Coptis chinensis can be good for the stomach, heart, and liver. However, pregnant women are advised against Coptis chinensis because of its application as a uterine stimulant.